It's almost gotten to the point where we over think Valentine's Day. For a fair few years I barely took notice of it (in part, due to it also being Mr Style Guide's birthday), but now I'm coming more and more around to the idea of using Valentine's Day to gift a token of love for that special someone in your life. 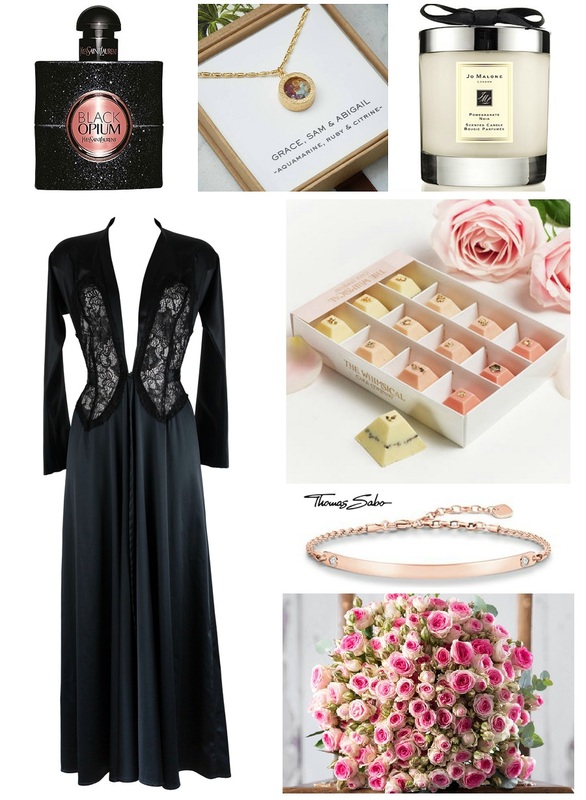 As with every holiday, of course it's gotten commercial but it doesn't need to be as complicated as some gift guides would have us believe and so I've put together a classic and wistful Valentine's Gift Guide. Classic gifts only maybe a little more expensive than a woman can sometimes justify spending on herself. This is where not over-thinking it comes in. If you're trying to think of a gift for your loved one, think of what they like, what they buy themselves, what they chat about... then look for something similar, only a little special. If you're opting for gifting a perfume this Valentine's Day, have a look at her perfume collection, is there anything running low? Have you heard her mention a new fragrance, wistfully sighing how she wishes she could justify it? Black Opium has been getting rave reviews (just in case you're going in blind), a very sensual and musky fragrance, it's a sultry gift that will definitely bring a smile (if not for the packaging alone!). A lot of women, myself included, love jewellery. It's like we have built in magpie eyes! I came across the stunning Mixed Birthstone Locket from Cinderela B Jewellery a while ago and I think it's the loveliest idea! They mix birthstones of your choice in a stunning jewellery surround. A piece to be treasured throughout the years. Similarly, the new Thomas Sabo Bracelets can be engraved with a name or short message of your choice. Giving jewellery is usually always a winner and when you personalise it takes the gift and the message up a level. Want to keep it really classic and you perhaps watch your wife buy herself more budget friendly candles and flowers throughout the year? You hear her sighing when her favourite Yankee Candle runs out and she is trying to justify buying another so why not really push the boat out and surprise her with something truly luxurious like the famous Pomegranate Noir Scented Candle from Jo Malone? If you're looking to really make an impact with a bouquet this year I couldn't recommend Appleyard London enough. Stunningly arranged blooms that look and feel exquisitely special. I frequently get lost browsing through their pages of arrangements. It's hard to imagine going wrong with chocolate and opting for something a little different, something that looks a little more romantic makes all the difference at Valentine's. The Whimsical Cake Company offer chocolates with that 'ooooooooh' factor. Just looking at the Ombre Pyramid Chocolates is making me swoon a little inside. Finally, the really tricky gift that a lot of men hmmm and haaa over... Lingerie. Once a fairly traditional gift to give her on Valentine's day, lingerie has been shunned a little over the years but for me, nothing is more luxurious than being gifted an item you would never dream of buying yourself. I'm not talking fishnet everything here, in fact I'd recommend staying away from the usual underwear gift ideas and instead recommend going with something Hollywood inspired, ridiculously extravagant, the stuff of daydreams. Sometimes I'd love nothing more than the glam life but the reality is I'm a Mum and that leaves little room for lazing around on a chaise longue, staring into an engraved silver mirror, dreamily brushing my hair whilst wearing a stupidly impractical robe and fluffy kitten heeled slippers. However, owning a little bit of that daydream, such as the GORGEOUS Nell Robe from Betty Blue's Loungewear, means a lot when it's gifted by someone who knows your daydreams inside and out plus, a robe is a good idea as it means less investigating in regards to sizing (always a tricky issue). My advice is simple. If you can afford high end and are going all in for the whole Valentine's Day she-bang, just look around and see what your loved one enjoys and look for similar, just maybe a bit more of a luxurious brand. You really can't go wrong, and if you're worried that you still don't know what to get, I guarantee any of the above will garner some serious brownie points. *Though this was a high end gift guide, don't fret because the more budget friendly version is on it's way.